Baba often used to fly into temper. This was only an outward appearance. Sometimes He used to throw he stick at someone ten feet away. Shyam once asked Him, "Swami, You are hurling the stick at the man in such a rage. Supposing something happened to him and he died, will you not get a bad name?" Baba replied sharply, "Saitan! You keep quite. That fellow’s life is in my hands. He will die only if I permit him. You better mind your business. Why are you bothered about others? That man will come to his senses only if he sees Me in this manner. If I am indulgent they will try to ride the horse." Thus, in this way, Baba used to discipline people by threats and harsh words. It is only with this aim and not for any other purpose. This secret was revealed by Baba only to Shyam and none else. Baba’s life was really a sage of love ad nothing else. Keeping Shyam near Him and allowing him to serve Him, Baba spent many years. One day, Baba called Pradhan and asked him to construct small tank. Pradhan was thus the first to be involved in the building of a samadhi for Baba. The Lord is all prema. It has no anger or dwesha in Him. Once in Shirdi, a certain Dr. Pillai came with much suffering. He prayed that he might be given ten births with the chance of dividing the pain into ten parts, so that he could suffer a little each time and pay of his karmic debt, without being hard pressed of having to pay it all in one birth. He was informed through Kaka Sahib that he should fall at the feet of Baba and as he did so, Baba got the pain transferred to Himself. For ten minutes, Baba suffered at the rate of one minute for each Janma, (Birth) and thus he rid Dr.Pillai of his obligations. Baba was quite normal as soon as the 10minutes were over. In 1917, Baba called Abdul Baba, Nana Chandorkar, Mahalsapathi, Das Ganu and others and started asking each of them. "Do you know who you are?" Each of them replied, "I am your sishya (Disciple). Baba said, " Nonsense! Don’t use that term any longer. I have no disciples in this world. I have countless devotees. You do not recognize the distinction between a disciple and a devotee. Anyone can be a devotee. But, that is not the case with disciple. A disciple is one who carriers out implicitly the commands of the Guru (the preceptor). The mark of the Sishya is total devotion to the preceptor. Only the man who says, "I have none in the world other than the preceptor" is a disciple. How far have you respected My injunctions? How are you entitled to claim that you are My disciples? Only the one who follows Me like My shadow can claim to be My disciple. The devotee is one who prays to the Lord wherever he may be. Hence, there is a big difference between a disciple and a devotee. The disciple and the preceptor are like two bodies with one spirit. The disciple should have no sense of separateness from the preceptor. He should feel, ‘I and you are one’. There are so such disciples to be found in the world. There are millions of devotees, but no disciples". On hearing this Shyam was in deep pain. He felt within himself, "Apart from serving at your feet, I have no other concern." Baba then went into another room and called Shyam inside. "In this entire world, for Me you are the only disciple, others are my devotees." At that moment, Shyam fell at the feet of Baba, and cried out, "You alone, you alone" (are my refuge) and breathed his last! In all His life of over 83 years, Baba had never shed a tear in the presence of devotees. When Shyam passed away, He shed three drops of tears. The devotees present there said, "Swami! Why do You feel so grieved? All are in your hands." Baba replied, "Dear boys! I am not grieving at all. Almost all his sins had been wiped out already. By the three tear drops I shed, the remaining sins (of Shyam) have been washed away." All that Baba said or did was for the good of the devotees alone. Towards the end, Abdul Baba came toBaba. Baba told him, "I shall appear again and give you Darshan!" "When will that be?" asked Abdul Baba. Baba told him, "It will be after eight years." "The first advent of Sai was in Maharashtra. The second advent will be in Madras." Baba said. It should be noted that when this form (Sathya Sai) made its advent, Andhra Pradesh was a part of Madras Presidency. When He was asked in what form the next advent would take place, Shirdi Baba told Abdul Baba alone, "I will give Darshan in the name of Sathya for upholding Truth!". That is the present advent. The two bodies are different, but the Divinity is one. The first advent was for revealing Divinity. The second advent is to awaken Divinity (in human beings). The next advent is for propagating Divinity. The three Sai are Shirdi Sai, Satha Sai, and Prema Sai. Baba had told His close devotee, Kakaji in the year 1916, that Dada would be shedding His mortal coil in 1918. Kakaji thought that Baba was mentioning only about Dada Sahib, and never thought the reference was to Baba Himself. On September 28th, Baba developed high temperature. Two days earlier, He had collected food by seeking alms in some houses. He took that food and at noon, He expressed His wish to His devotees that He should be taken from the choultry to Booty Wada. He hoped to have a quiet time there. In that Wada, a devotee by name Booty had a built Muralidhar temple. He wanted Baba to install the idol of Krishna in that temple. But, Baba was putting off the installation on one pretext or the other. Booty did not want to install the idol without the blessings of Baba. Till His end, Baba did not say anything about installation of the idol. He directed Booty and Kakaji to go and take their lunch. Feeling that Baba was better, they went out. Baba had nine one-rupee coins under His pillow. He took them out and gave them to Lakshmi bai. Then Baba passed away.. It was the year1918 and Pradhan;s wife, who was living in her native village, had a dream in which it appeared that Baba had passed away. Pradhan was in Shirdi. On waking up, she started crying over the passing away of Baba in her dream. At that moment she heard a voice in the house declaring, "Don’t say that Baba has died. Say that Baba is in a state of Samadhi. ‘Samadhi’ means equal mindedness. Life and death are alike. Joy and sorrow, profit and loss are all the same. Hence there is no such thing as death for Baba". This was what the voice declared. When she was trying to find out where this voice came from, she received a message from her husband conveying the news of the passing away of Baba. That occurred on the Vijayadasami day (1918). September 28th 1835 was His date of birth. On Vijayadasami day, He gave up His body. Mathaji Krishna Priya came to know that Baba had left His mortal coil at 2.30 p.m., on Vijaya Dasami day in 1918. She felt very sad the whole day. The next day she closed all the doors and windows in her house because of severe cold in Shimla. While she was resting in the house, a tall and well-built monk arrived at the next door and inquired about Mathaji’s house. He made inquiry not because that He did not know where Mathaji lived, but only to make others know that He was physically present in Shimla. The neighbor sent a servant with an umbrella (as there was snowfall), to show the stranger Mathaji’s house. He knocked at the door. Mathaji opened the door and could not believe the evidence of her eyes. She wondered how Baba, who had passed away the previous day, could come to Shimla. She asked, "How did you manage to come so soon. It takes at least three days to come from Shirdi to Shimla.". Baba said, "Beti (dear daughter), I am everywhere. You have worshipped Me in the form of Krishna. Is this all that you know about Me? I am feeling very cold. First get Me hot tea." She prepared tea and offered it to Baba. After taking tea, Baba said that He was hungry after His long journey!! Krishna Priya brought Him Chapathis and brinjal curry that Baba used to like very much. After taking the food Baba washed His hands and wiped them in a towel. He then told her, "The purpose for which I came is over and I am going away." In those days, there was nobody to exchange words with Baba. If anyone opposed or said anything to the contrary, Baba would wield the stick against them. He never brooked any contradiction. Hence, Krishna Priya could not tell Him anything. He gave her a jasmine garland. Krishna Priya watched Him as He went out walking through the bazaar. In Shimla, on the roadside, there are usually deep valleys. As Baba was walking along, some workmen were engaged in some roadwork. Noticing that Baba had fallen down from the road, they ran to rescue Him. But, they could find nobody there. Baba had just disappeared. Before taking leave of Krishna Priya, Baba whispered in her ears, "See Me in 1926." She did not know where to see Him. When I (Sathya Sai) went to Shimla, Krishna Priya came to see Me. She was shivering on account of age and the cold weather. She asked, "Baba, have you forgotten the promise that you made to me long ago?" I told her, "It is you who have forgotten, not I. I never forgot what I promised." When Shirdi Baba sought to impart wisdom, it was not through discourses. Everything was taught by stern methods. It was because of the conditions prevailing in those days. On September 28th, 1918, Baba developed fever. For 17 days thereafter, he was quite well. On October 15th, Baba was not to be found anywhere. Nana, Kaka, Das and Lakshman Rao made a search for Him all over the place. There was a small well nearby and they went to see whether He had fallen there. When they returned to Baba’s abode, they found Him standing near the door. Baba told them, "Where are you searching for Me? I am in one place and you search for Me elsewhere. I am in all pure hearts. You are searching for Me in all polluted places. How can you find Me?" He then sat down. Baba left His body only on October 15th. After Baba left the body, several controversies arose. Mohammadans came there and claimed that the body belonged to the. The Hindus claimed that the body belonged to them. Baba used to declare from time to time, "Allah Malik! Allah Malik!" On account of this, Mohammadans claimed that Baba was a Muslim. At other times, Baba used to say, "Rama Malik! Krishna Malik!". For this reason, the Hindus claimed He was a Hindu. Because of these rival claims, the body was kept for 36 hours as no decision could be arrived regarding the manner of disposal of the body. To prevent clashes between the people, officials arrived there. They asked all the residents of Shirdi to assemble there. They decided to take the vote of the people to find out how the majority of the local population wanted the last rites to be done for Baba. Everybody favored the Hindu way of disposal of the body. When this suggestion was arrived at, a pit was dug in the Booty Mandir. Some persons opposed the digging. The dispute went on and ultimately the collector and the police arranged for the Samadhi to be consecrated in the Muralidhar Mandir. That temple is the present Samadhi Shrine of Baba. At this time, a remarkable incident occurred in Shimla. Mathaji Krishna Priya placed the garland given to her, on the idol of Krishna in the presence of all in her residence. Many wondered why she was garlanding the Krishna Idol when she was a devotee of Sai Baba and there was a picture of Sai Baba there. Bhajans were in progress at that time. The garland placed on the Krishna Idol dropped on the picture of Sai Baba. The garland placed on Baba’s picture moved to the figure of Krishna. Everyone in Shimla rejoiced in the discovery that Krishna and Sai Baba were one. When all the people came there the next morning, they found tat the garland given by Baba was no longer on the figure of Krishna. 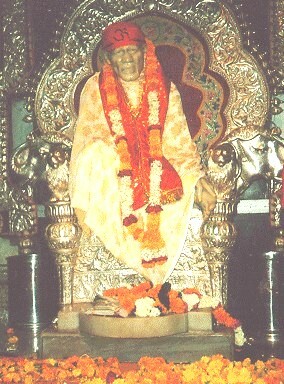 That garland was found on the Samadhi of Baba in the Booty Mandir. Why did Baba manifest miracles? In those days, there were bitter differences between Hindus and Muslims. With a view to end such communal differences, Baba wanted to show through His miracles, the truth that Baba is the Supreme Master of all beings. He had no difference of caste or community. His religion is common to people of all faiths. It is good for everyone. It is observed by all godly persons. This is the creed of all mankind!! !